In one sense the current trend toward nationalism (toward fascism, to give it its true name) can be thought of as just ‘more of the same’. I was a teenager in the late 1970s and I vividly remember the abuses of the National Front (NF) with their violent rampages and attacks on black and other ethnic minorities. By the mid 1980s these racist thugs had morphed into the British National Party (BNP) in an attempt to develop a veneer of respectability to cover their abuses. 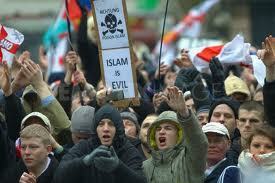 It is out of the ranks of the BNP that the current threat, the EDL has arisen. 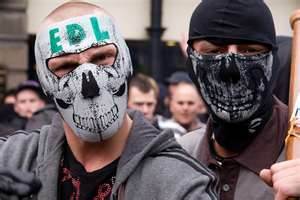 The English Defence League (EDL) claims to represent the traditional values of the working class. However even the briefest glance at the history of working people in the United Kingdom shows this not to be the case. My people, the working class majority, have always opposed fascism. Ours is a socialist tradition where all people are judged upon merit, not colour or religion, where a fair day’s work is rewarded with a fair day’s pay and where the vulnerable are protected by the people around them. It was the white working class people of Britain who opposed Moseley and his fascist Black Shirts at the battle of Cable Street. It was the white, working class people of Britain who stood shoulder to shoulder with their Black and Aisan neighbours to beat back the National Front during the Battle of Brick Lane and it is working class whites who today stand in solidarity with their Muslim neighbours against the English Defence League and the British National Party. The modern nationalist movement can be traced right back to the brown-shirted thugs of Baronet Oswald Moseley – a group of Nazi sympathisers who wanted the UK to join Germany and Adolf Hitler in his bid to subjugate Europe under the fascist jackboot. Working backwards from the EDL and UKIP we can move effortlessly back to the BNP and the NF, from the NF to Enoch Powell with his ‘rivers of blood’ rhetoric until ultimately we land on the doorstep of Moseley himself. This is far from a working class movement. Baronet Ernold Oswald Moseley was a British aristocrat who thought no more of the working classes than did any other aristocrat, then or now. He saw working people as resources to be exploited, much as (arguably) the wealthy, aristocratic conservative party does today. And Moseley knew, as Hitler did, that the best way to exploit the masses is to pretend that you are on their side. This means finding a scapegoat to hide behind. People who are downtrodden will always need someone to blame for their misfortune. It’s better for the fascist to keep the poor blaming each other than to let them know that the real enemy is their ultra right wing ‘friend’. Why are we so downtrodden? There have always been exploiters and those exploiters have always sought to scapegoat others as a distraction to hide behind. Let’s face it – even when Europe was essentially white there were poor people struggling to survive. The workhouses and mills of Victorian England weren’t run by Muslims – they were run by Christians who exploited the workers for their own ends. The feudal system that saw so many peasants starve to death wasn’t the creation of Islam – it was the work of white Normans (the ancestors of Nick Griffin of the BNP, as it happens). This series then is written as much for English Defence League supporters as it is for anyone else. It’s an attempt to ask them to calm down and deal with the real cause of their dissatisfaction through the ballot box. The real reason that working people are downtrodden in UK has nothing to do with Muslims. Nor are the current acts of terrorism the fault of our working class neighbours here in UK. There have been religious terrorists of all stripes for decades. Remember the IRA. Remember the Orange Volunteers. Remember Aanders Breivik. They were guilty of appalling atrocities in their day but nobody blamed all Christians for it. It’s equally wrong to blame all Muslims for the violence of a few. If you truly wish to support the working classes of UK. If you genuinely want to improve the lot of disadvantaged citizens then stop targeting equally disadvantaged Muslims and start voting instead. If you genuinely want to combat terrorism then stop wasting public resources policing your attempts to defend empty car parks or smash up public houses. And stop beating people up just because they look a bit foreign. Above all – stop firebombing Mosques, assaulting non-whites, sending hate mail, nailing pigs heads to places of worship and stripping Hijabis in the street. These tactics do you no favours – not least because you’re aiming them at the wrong targets. Please stop being the distraction that prevents the working class from tackling the real problems of inequality and exploitation that concern us all regardless of colour, creed or ethnic origin.